As I talk to Lorne Campbell about Northern Stage and this year’s programme at the Edinburgh Fringe, one word keeps stubbornly recurring: “conversation”. 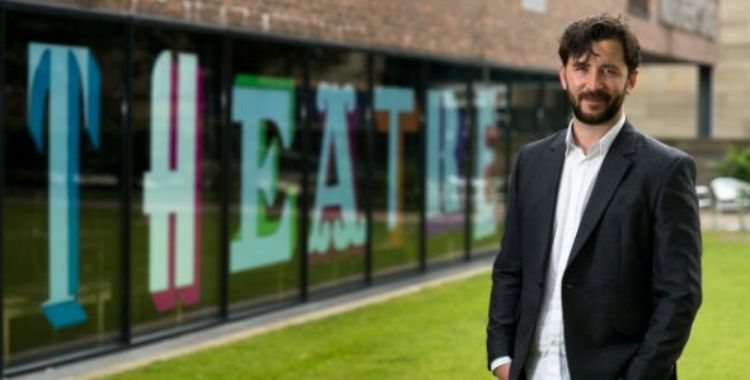 The theatre’s new artistic director, still only five weeks into the job, shows a profound understanding of the role of organisations such as Northern Stage in the many current dialogues around theatremaking – dialogues about funding, about politics, about artistic practice. As a key regional producing theatre, Campbell believes that Northern Stage has a responsibility to engage in, respond to and act as a catalyst for those conversations. At the point at which Campbell is taking the reins at Northern Stage, this conversation and these understandings of regional identity are particularly urgent. As he explains, “everything’s on slightly shifting sands”; the organisation is currently coping with cutbacks from the city council and Arts Council England, at the same time as bracing itself for further slashes to its funding. “In the face of all of that, it’s about trying to find the most dynamic and optimistic model you can, but it’s quite difficult to plan into the medium term,” Campbell admits. While the necessity of protecting the theatre in the short term makes longer term visions difficult at this stage, Campbell makes it clear that Northern Stage’s community of artists is a key priority. “I’ve arrived at a very interesting moment where there is a hugely exciting cohort of artists and companies and writers and actors all coming through in the North East,” he explains, “so a big challenge for us is how we not only protect that generation of artists, but continue their momentum.” He describes the present as a “really potential-filled, optimistic moment”, but he’s under no illusions about how easily that potential could be wasted if the theatre is not able to continue supporting the development of those artists. Another repeated word in Campbell’s vocabulary, despite the difficult times that Northern Stage and other organisations currently face, is “optimism”. He remains hopeful about the theatre’s ability to harness its resources in support of the artists it has discovered and nurtured over the years, as well as about the potential of the main stage. “We need to make more work on it,” he states, firmly and unequivocally. “More of our own work and work which tells exciting, contemporary stories about not only the present of the North East, but also the future.” He imagines this stage as “a political space, sort of inspired by Joan Littlewood and John McGrath”. “So much of it is about exercising community,” Campbell explains as he outlines his approach. He smoothly segues into talking about St Stephen’s, the Edinburgh Fringe venue that Northern Stage first occupied last year under previous artistic director Erica Whyman, and the range of different communities surrounding that project. Linking together artists from across the North of England in an ambitious curated programme, St Stephen’s offers an overlap between different areas, companies and artistic practices, as well as opening a dialogue with other venues and with the communities of both Edinburgh and the Fringe. Stressing the importance of engaging with the people of Edinburgh as much as with the festival as a separate entity, Campbell insists that this balance is “absolutely vital”. “I think it’s one of the great ignored truths of the Fringe,” he says. “The majority of tickets are sold to Scots who come to the festival; the tourist ticket buyers are still in the minority. So if you don’t connect to a local audience, you’re going to have a very hard time.” Having been brought up in the city and worked at the Traverse Theatre earlier in his career, Campbell has an obvious advantage here. “It feels like an old biorhythm waking up,” he laughs, adding, “it’s going to be lovely to be embedded in it”. “I wanted to try and find a project that brought those communities into contact with each other,” Campbell continues, “to talk about something in the political zeitgeist, but also to exchange practice and to be in the same room together.” His unique artistic solution was inspired by border ballads, “a narrative folk tradition that belongs as much to Northumbria as it does to the Scottish lowlands and the borders”. Campbell has commissioned six artists to write their own versions of what a border ballad might look like today, while throughout the festival another epic ballad will be composed by a range of guest artists contributing a new verse each night. “That ballad begins with a foundling babe being discovered in a Moses basket floating down the River Tweed on the night of the dissolution of the act of parliaments between England and Scotland,” Campbell tells me, “and then the poem will tell the next 95 years of that child’s life and the next 95 years of an imagined non-United Kingdom.” Incorporating a diverse mix of artists with a range of different political views, Campbell hopes to open a lively debate about Scottish independence, which he suggests is “much more than a question about whether Scotland should be an independent country or not”. As he continues, “it’s a question about how optimistic or pessimistic we feel about the potential of our political future”. Another strand to this dialogue within the programme is Make. Do. And Mend, a one day event that aims to gather a wide range of voices in theatre to discuss problems and implement solutions. Feeling the need to create an event that acted as well as just talking, Campbell and the team at Northern Stage “wondered what would happen if we tried to create an event which actually resulted in immediate action that day”. Campbell is determined that “you can’t just repeat” and hopes that this gathering will prevent the talking in circles that we are all too good at.